The phrase “appropriate degree of gratitude” is actually a deeper sentiment than one might think at first glance. I think many people, consciously or unconsciously, have a picture of what the recipients of charity look like. It’s what holds us back from really understanding poverty and homelessness. It is quite possible that one can dress well and have a vehicle, but not eat more than one meal a day. Our society encourages giving but doesn’t hold up a very high regard for those receiving. 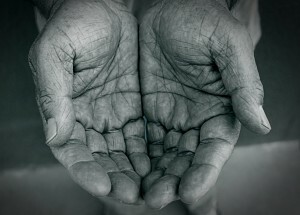 In fact the “better to give than to receive” promotes the sentiment that receiving is bad. Is it surprising then that there can be a loss of self esteem and in turn an increase in self loathing? How grateful then would any of us be to be the recipient of giving? And, what is the appropriate degree of gratitude under these circumstances? Thanks for shining a light on this Abe.